Root Cause Tips – All Safeguards are not created equal… or, why do corrective actions fail? Happy Wednesday and welcome to this week’s Root Cause Analysis Tips. The topic this week is strength of safeguards. The diagram shows that the best corrective action is to remove the hazard; if we cannot do that, maybe we can reduce it (chemical substitution, for example). If we can’t do a #1, possibly we can move the target away from the hazard (moving a desk in the warehouse away from forklift traffic, for example). We keep moving down the list from strongest to weakest. But we start at the top. So here is my question: If I were to pull out of random stack of investigations from any company, anywhere, what kind of corrective actions do you think I would see? What about your company? If you said 5’s and 6’s, you now know the reason that you have repeat incidents. Please do not misunderstand me; I am not saying training and supervision are not needed, what I am saying is they are weaker safeguards. 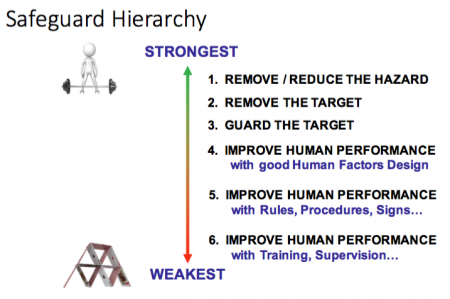 They can be good corrective actions and sometimes are the only ones feasible, but we should always start at the top of the matrix and work our way down. In my last column I talked about layers of protection. Pretty simple, more layers means more protection. However, since all Safeguards are not equal, many layers of weak safeguards does not equal a few layers of strong ones. If you just did this one thing in your company, I am confident that you would improve a great deal. Remember, corrective actions are the output of your investigation. You can do a great job on the investigation, but if you have weak corrective actions, you are WASTING YOUR TIME. So please think about it. Thanks for visiting the blog, and enjoy your week.